Kaysville, Utah – Feb. 2, 2011 – Monnit Corporation (www.monnit.com) announced today a strategic partnership with Florida based ICARE WIRELESS (Indoor Climate Alerting & Reporting Emails) to resell and install its wireless sensors to commercial property management companies across the United States. ICARE Wireless has already sold and installed sensors to critical acclaim in fifty-seven buildings owned by one of the largest commercial property management companies in southeastern Michigan. A four-story office complex that had a boiler failure over a weekend. 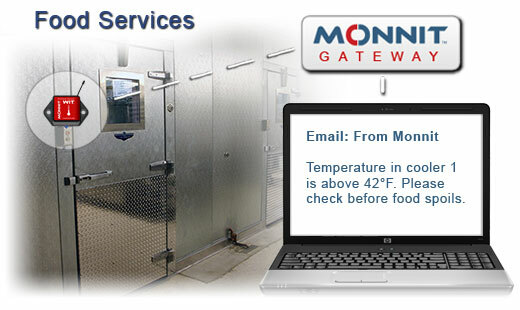 Monnit’s wireless temperature sensors immediately detected and alerted the maintenance staff that the temperature had dropped below a specified temperature. By the time the maintenance staff arrived at the building the indoor temperature had dropped to 34 degrees. If the staff had not been notified the building would have dropped below freezing and more than likely plumbing would have burst due to frozen pipes. Instead they were able to avoid the damage and fix the issue allowing employees that work at the office building to return to a warm office on Monday. Two separate instances were caught at a warehouse where heat failure allowed the temperature to drop to a level where the fire suppression system could freeze and potentially burst. These instances were caught immediately by the Monnit wireless temperature sensors and the maintenance staff was alerted in time to fix the heating issue before any damage occurred. In addition to ICARE, Monnit is providing its sensors to a number of other industries through strategic partnerships, including the North Carolina Sheriffs Department and Kesgro Kwekers. North Carolina Lieutenant Sherriff Don Barber and his team are using Monnit’s temperature sensors in their K-9 Unit, specifically for transport vehicles, patrol vehicle kennels, outdoor kennels and dog collars. Each year more than 50 working dogs in the United States suffer some form of heat related casualty either from heat exhaustion or freezing from cold temperatures. Barber has been a K-9 trainer and handler for more than 14 years and for the past 4 years has been working with a German Shepherd named Pia. Kesgro Kwekers based in the Netherlands is one of the largest providers of tomatoes in Germany. The company currently uses 80 temperature and humidity sensors within its three greenhouses (70 acres total) to provide its customers with fresh produce in the most environmentally friendly way while minimizing the use of power and energy. Monnit’s wireless sensors are designed to detect and monitor every function critical to business or personal life, including, the presence of light, water, humidity, temperature, movement and distress. For more information about becoming a strategic partner or reseller of Monnit wireless sensors, call (801) 561-5555 or visit, www.monnit.com. We came across an interesting article discussing the increased use of wireless sensors in home appliances. Using wireless sensors to monitor the temperature in coolers and freezers. You have invested a lot of time and money in your food preparation business. A lot of that investment is from the purchase and operation of your food storage freezers and coolers, as well as the food that you keep stocked in them. What would happen if there was an extended power outage or a malfunction with one of your coolers when nobody was there to check it? How much food could you lose, and how would that affect your ability to prepare meals for your loyal customers? With Monnit WIT Wireless Temperature Sensors you can have 24/7 monitoring of your freezers and coolers and enjoy the piece of mind that comes from knowing you will be immediately notified if the temperature is the slightest bit above your set threshold. You can also add multiple people to your notifications, so your maintenance or repair person can be notified immediately as well. You can avoid costly food spoilage and potential freezer damage by catching issues quickly before the issue has a chance to escalate. When dealing with battery powered wireless sensors, there are a many factors that can affect the life span of the battery. We have compiled a list of useful tips to help you understand wireless sensor power management and improve the life of your wireless sensors’ batteries. Monnit provides a great wireless sensor product with a small footprint, allowing our sensors to be placed inconspicuously so they do not draw attention. In order for us to achieve this small footprint, our standard wireless sensors are powered by a CR2032 coin cell battery. The provided coin cell battery provides 225 milli-amp hours (mAh). If you require a longer battery life for your application, we currently provide a AA battery option for our wireless sensors that provide 3,000 mAh (~10 times the battery life). How frequently your wireless sensors transmit (heartbeat) can have a severe impact on the life of the battery. A Monnit WIT wireless sensor with a standard coin cell battery transmitting once an hour will last approximately 2-4 years depending on environmental conditions. If you want to preserve the battery life of your wireless sensor, set the heartbeat (transmission interval) as high as your specific application will allow for. Batteries are electrochemical devices which convert chemical energy into electrical energy. Extremes in temperature can cause the chemical characteristics of the battery to change, causing the battery to burn power faster when hot or not generate enough current when cold. In order to maximize the battery life of your wireless sensors, keep them as close to room temperature as possible (°60 F – °70 F). The radio transmission of your wireless sensors is a two part process. The sensor transmits its data to the Wireless Gateway Transceiver then listens for a reply transmission to acknowledge that the signal was received. When there is a significant amount of radio noise or interference, your wireless sensors may have to transmit longer in order to send and listen through the interference. If the signal is not received and acknowledged, the sensor will try to transmit again until it receives a successful response. Both of these issues can have an impact on battery life. Monnit wireless sensors operate on the 900MHz frequency that is less crowded than the popular 2.4GHz and higher frequencies, so you already should expect less interference using Monnit WIT Wireless Sensors. To ensure optimal performance of your sensors and batteries, try to avoid areas that have an excess of radio interference from other devices.